Click on the button below to see who’s signed up for which shifts – updated 6/26/18. 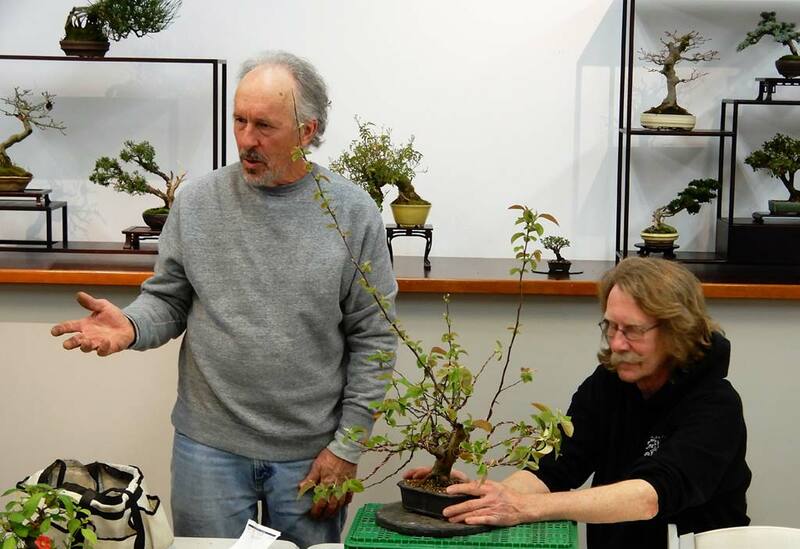 Please use the ‘Contact Us‘ form or email info@marinbonsai.org to sign up. We will have admission tickets for docents and parking passes for those who pull multiple shifts at the June 19 workshop. This is the time of the year the club members really pull together to promote our club in the best possible way through the display of our bonsai. Please prepare your trees to show their best. Sign up for multiple docent shifts if possible. We need as many volunteers as we can muster. 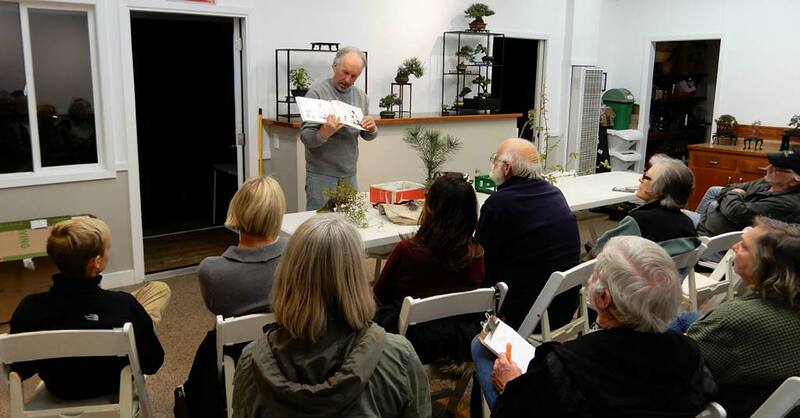 The Fair is always so much fun; we get to promote the Marin Bonsai Club, sign up individuals for the beginners’ bonsai class and auction following the Fair, all of which attracts new members. Our bonsai exhibit is a big draw among Fair-goers and we need to make this one another standout. I hope everyone will lend their support. 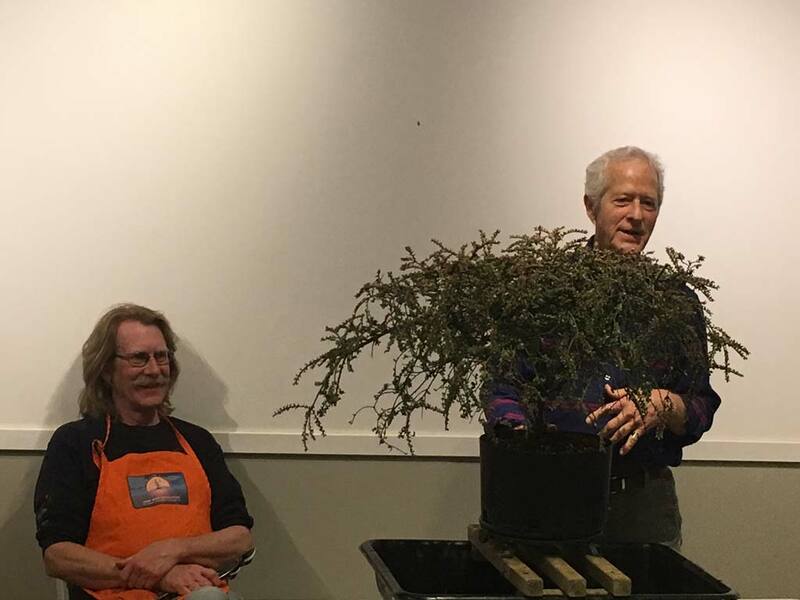 The doldrums of this April’s showers were broken by the antics of our club’s own favorite bonsai duo, Chris Ross and John Doig. In their usual style where Chris does most of the talking and John does all the work, the pair brought form and energy to an otherwise common cotoneaster and smiles to the faces in the packed audience. 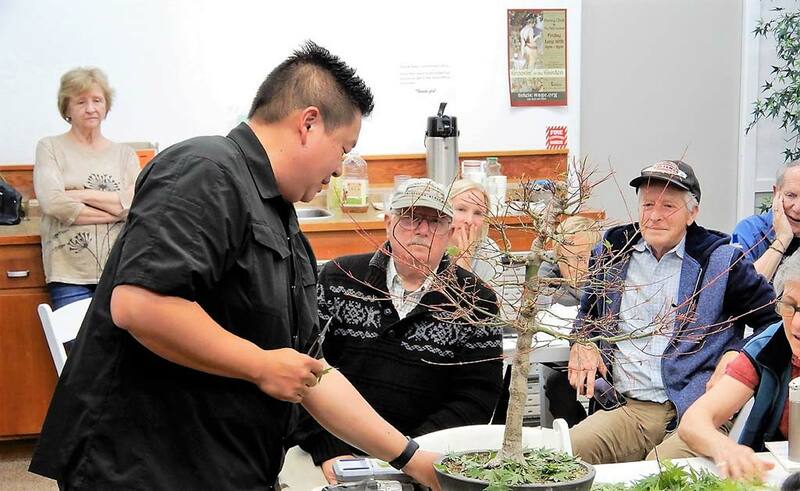 With his opening volley, Chris jumped right into his well-known banter about what makes a bonsai. He mentioned “emphasizing the vagaries of nature” and called the goal in bonsai “what a tree could be if it went to tree college.” Meanwhile, John, who had been in the background hungrily fondling tools, busted in at this last comment, eager to get chopping on the bushy cotoneaster before them. A few notes about the subject matter: This cotoneaster came from John’s favorite, “secret” landscaping tree source, so it had been raised so far in its life to become a shrub, hedge, or some other large-scale plant. As is, it was a sturdy, bushy, even attractive little shrub, but a clear path to a bonsai it had not. But after caring for it for a few months on his property, and some prior consultation with Chris, John had a reasonable idea where he was going to take this tree’s bonsai potential. The trunk quickly split into two, and branches of various sizes, some appropriate and others not so much for their locations, were copious all over the tree. John was so eager to cut some obvious inappropriately located branches off that he had to be interrupted by Morris Dailey, who asked, “What about choosing the front?” Although they explained that there is just so much that is crying for removal from this tree that it’s not important just yet, Chris and John nodded to tradition and stopped what they were doing to go about selecting the front for the tree. There was some disagreement in the audience, but one side was chosen as the front, with a nearly opposite location indicated for secondary consideration once some of the clear-cutting could be done. 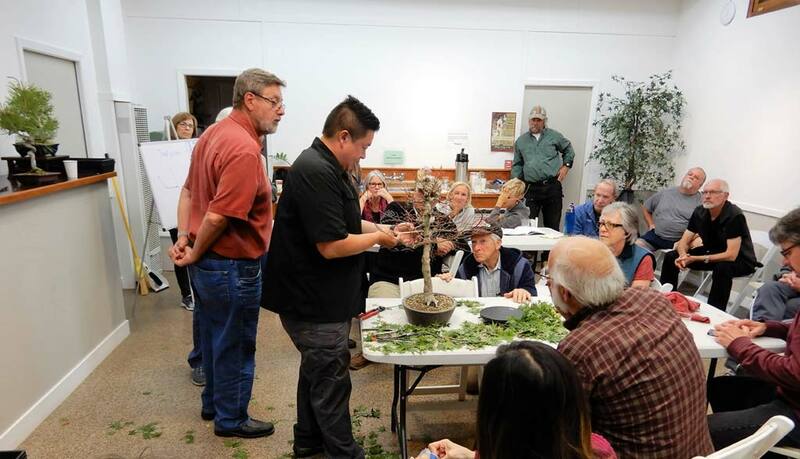 Shohin bonsai was the topic in March when Bill Castellon, an accomplished bonsai artist who used to conduct shohin workshops for our club once upon a time, gave us a highly informative lecture and demonstration on the topic of these smallest of our small trees. 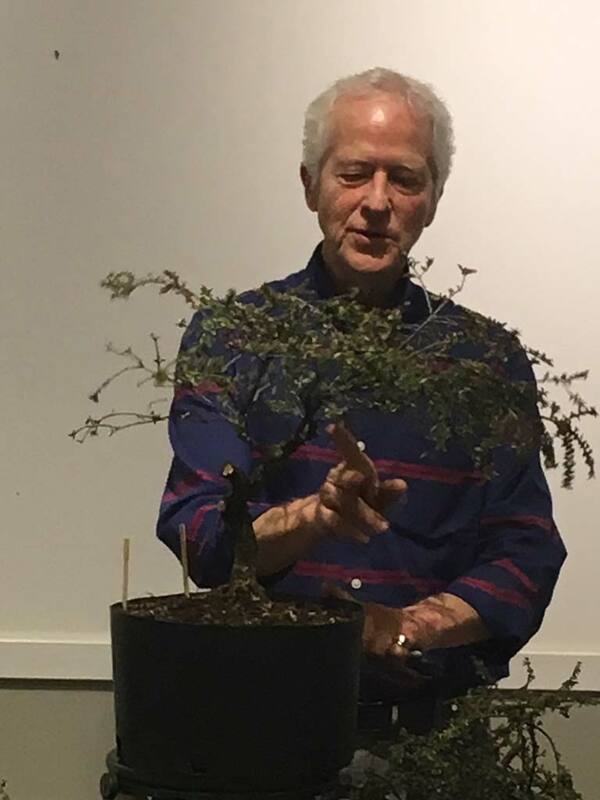 Clearly an extremely knowledgeable artist and horticulturalist, Bill was able to discuss a wide variety of bonsai topics in addition to shohin as he introduced us to and proceeded to transform a Chinese quince, which was raffled off at the end of the night. As a bonus, he also discussed and raffled off a black pine. Bill began the evening with some general guidelines for shohin, then spent 30 minutes discussing some of the key points to be considered when displaying them. 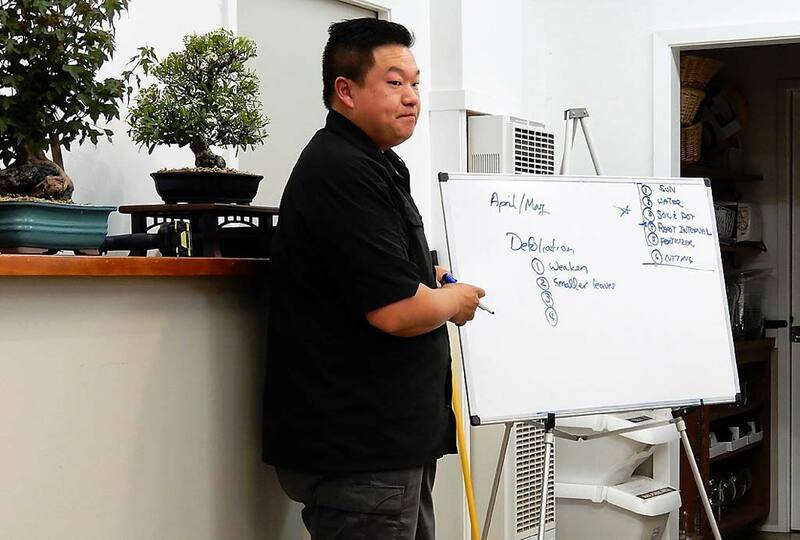 He pointed out that while shohin are typically defined as small trees under 20 centimeters (approximately eight inches) in height, with smaller pots than regular bonsai, simple definitions are often inadequate — a common problem in bonsai, it seems. You cannot chop all but the bottom eight inches from a larger bonsai and call it a shohin any more than you can put a shrub in a pot and call it bonsai. 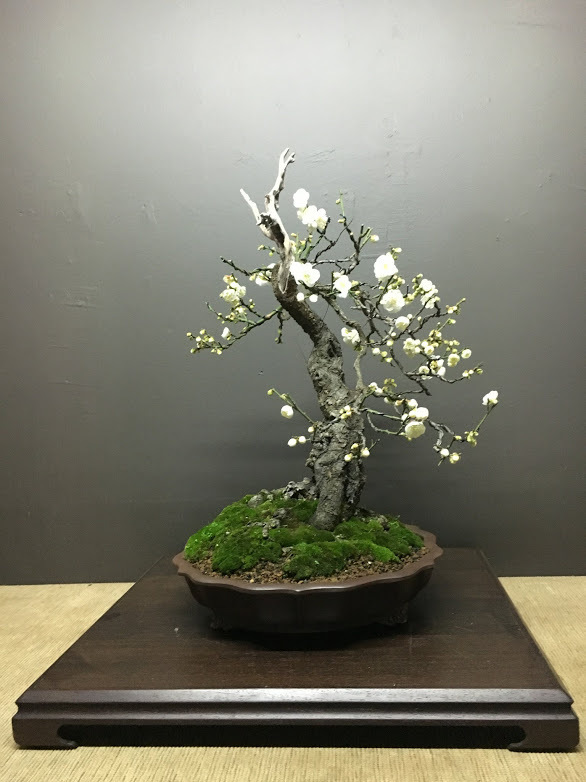 In addition to the subtle qualities that define bonsai, there are certain stylistic nuances unique to shohin. And Bill was there to show us a few development techniques adapted specifically to coax our trees into convincing depictions of old trees that can fit in one of our hands. 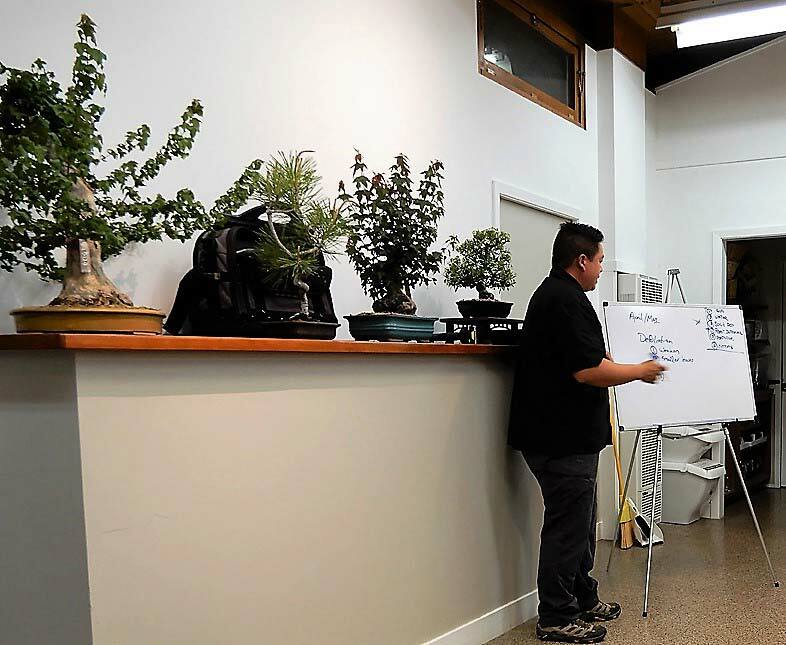 The classic shohin setup for a Japanese bonsai show — Kokufu being the gold standard of shows — is to have a multi-compartment box-stand containing several trees, along with an accent plant and a companion or supporting tree that are placed off to one side of the box-stand. Applying the triangular ideal to plan the layout, one should place the strongest trees so that they occupy the corners of the triangle. 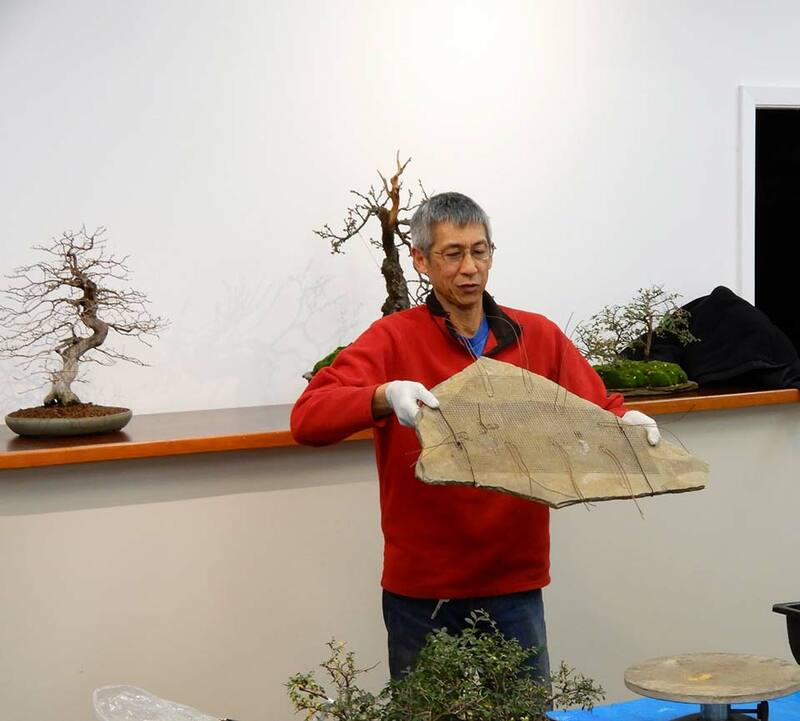 Along with numerous trees he brought with him, Bill used his own stands, props, and photographs from Kokufu show books to illustrate these and several other points relevant to showing shohin trees. 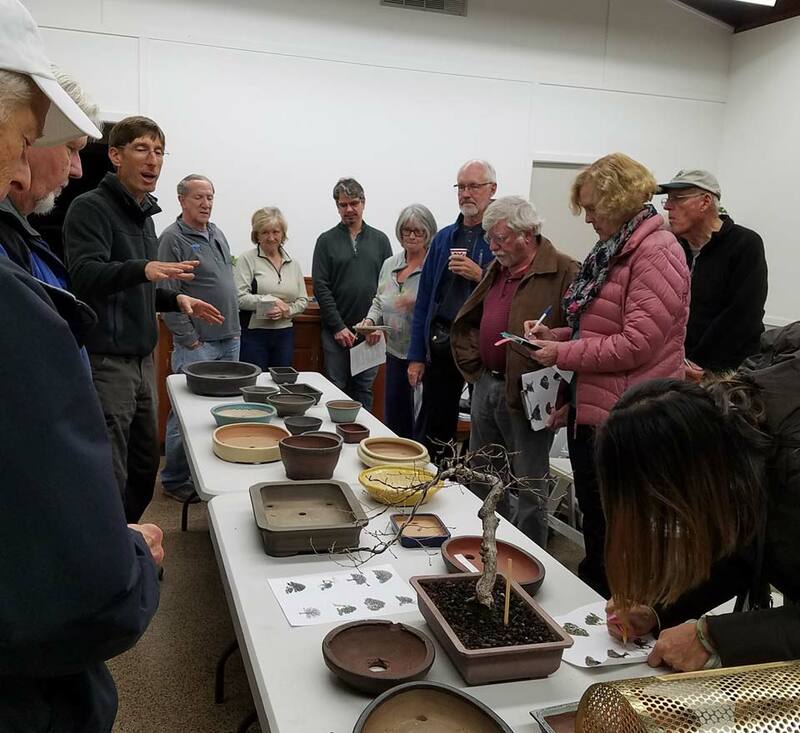 Jonas Dupuich joined us in November to help us better understand bonsai pots and the how-and-why of their importance to our trees. Echoing the last hour of our latest presentation from Peter Tea, Jonas started by pointing out that matching a pot to a tree alone is a huge topic, with a lot of variables to consider, and promised additional tidbits of information to round out the talk. For instance, it is important to know that the pots you see trees in at shows are most often different from the day-to-day pots for those trees. This is especially true in Japan, where the best shows occur during the winter, when transferring a dormant tree from one pot to another and then back again is no big deal. 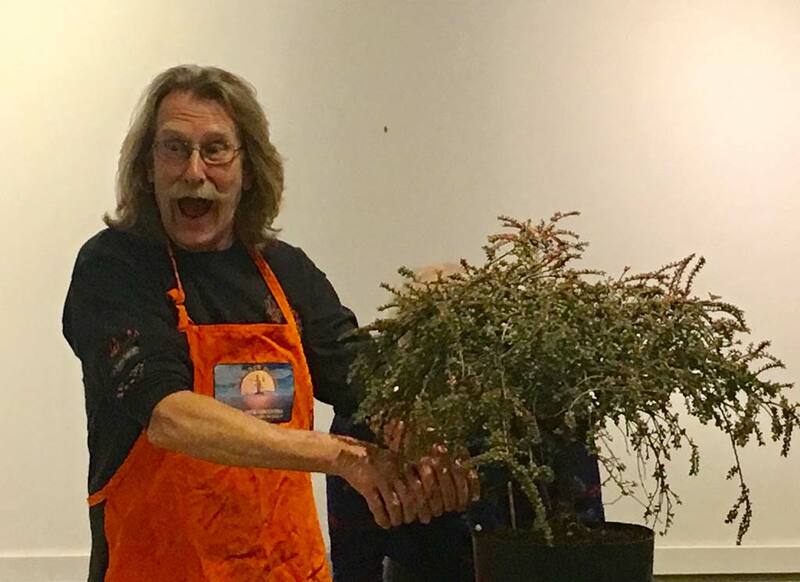 In his signature engaging style, Jonas started asking the audience for their opinions regarding the important points when matching a tree to a pot well before he distributed his very informative summary page for the talk, which had all of the most popular answers on it. 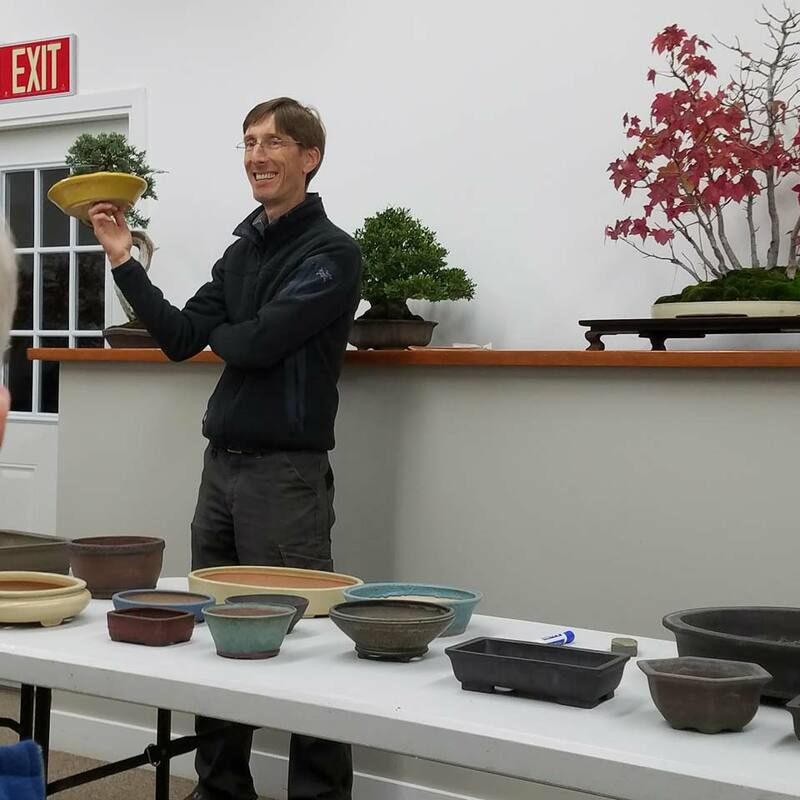 The important pot-choosing points named by the audience were glazed versus unglazed, oval versus rectangular, considerations of origins and styles, and keeping up with standards and trends, among others. Jonas’ handout, which loosely served as an outline for his talk, had the following five major topics, with three to five points under each topic: “Bonsai pot basics,” “Some conventions,” “Match the container to the stage of development,” “Consider pot alternatives,” and “Preparing pots for exhibits.” If you were not there to get a copy of the handout, try asking an active member for a copy. I’m sure somebody can scan it and send it to you.